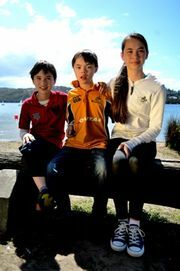 12 year old Nathan is riding in the Real Insurance SPRING CYCLE to help ten other kids with disabilities to ride a bike for the first time in their lives. Imagine if your child had a disability which affected their gross motor skills and you had tried everything you could to teach them to ride a bike but nothing worked. Then imagine that you found a way for them to safely ride a bike for the first time in their lives. That is exactly what happened for Emily Stewart and her son, Nathan. Nathan is an easy to please 12 year old who likes to play and watch footy, cricket, music and he loves to dance. Nathan has Down Syndrome (trisomy 21). It affects his speech and his gross and fine motor skills which means he can&apos;t keep up with people walking fast and is slow when it comes to walking down steps. In addition to his special lessons at his school, Nathan goes to speech therapy and occupational therapy to help him learn to speak louder and strengthen his gross and fine motor skills. Nathan is the quiet one among the three children in the Stewart family due to his diagnosis but he has a good understanding of what is being said to him. Nonetheless Nathan is very social and can be very cheeky! When Nathan was little he was always the passenger at the back seat with his older sister, Stephanie and younger brother, Jason, riding on the tricycle. As he grew, his mum, Emily, was concerned about his safety due to his balance, his problems steering and handling and knowing when he needed to brake. “You simply would have never thought he had any chance to ride on a regular bike because he wouldn’t be able to handle it safely and it would be such a dangerous thing for him to fall or ride into someone,” Emily says. A few months before Nathan was assessed for his Freedom wheels bike, Emily took him to Narrabeen Lagoon and tried to give him a bit of taste of what it’s like riding a bike. “I tried to help him ride a regular bike and it was such a hard work. Trying to hold his weight, trying to do the balancing but he didn&apos;t have enough strength to turn the pedals or understand how to brake, I still remember how hard it was and very disappointing,” says Emily. Nathan also tried his younger brother’s bike when he was around 8 years old that had training wheels but he just couldn&apos;t put enough pressure to turn the pedals to make it move and still didn’t have enough awareness about braking. 2 years ago Nathan was referred to TAD for a Freedom Wheels assessment with TAD’s Physiotherapist, Brendan. After Brendan measured him up, chatted to Emily about what Nathan was having difficulty with, Brendan chose a selection of modifications and adjustments to the bike for Nathan to try. Brendan attached modifications including outrigger wheels to help with balance, foot cups to help keep Nathan’s feet on the pedals, a high riser on the back so Emily can give him push or stop him without bending over and hurting her back. It was at that assessment when Nathan first rode a bike by himself. Emily says, “Nathan was riding on a trial modified bike and he was so, so excited to be able to manipulate it on his very own freely! And it also gave me a chance to witness the true potential for Nathan and the entire family that we would be able to benefit from this modified bike. You start to imagine many things, especially that the entire family would finally be able to go for a bike ride all together and Nathan would be able to do what his brother and sister are able to do. It closes the gap!" He enjoys bike rides because it gives him full control of what he is doing. Nathan can be riding very fast to catch up with is brother and sister while falling a bit behind just to enjoy the pets and people walking by and his mum Emily notices he handles the bike well around people on the paths. The Freedom Wheels assessments with the TAD Physiotherapist are provided to the families at no cost so there is no financial risk for attending and giving the program a go. The cost of the assessment, building the bike, modifications and other costs are subsidised by the generous donations to TAD. Many families face overwhelming financial stress including extra costs for things like speech therapy and occupational therapy. Emily has taken a break from work to be able to spend the time between the therapy appointments to work with Nathan on his exercises. “Because of the financial support we would never have been able to go ahead with the assessment with the TAD Physiotherapist or the cost of the bike and modifications. Family of children with special needs really need to have the flexibility with funding to be able to go ahead and try new things like the Freedom Wheels bike for Nathan. Thankfully there is funding support and now our family are able to spend time together on our bikes,” says Emily. “Nathan was very excited to have his bike, he was over the moon! Whenever Nathan is excited and he can’t come up with any words and he shouts ‘AUSTRALIA! !’ He also called this out when he did his very first dive at our local swimming pool. After he came up for air he cried out ‘AUSTRALIA!’ It means ‘I did it!’” Emily says. “The Freedom Wheels bike has truly increased his confidence, bringing the gap closer between his siblings, given us a fun activity to do as a family and knowing his inner potential to a greater extent!” says Emily. You can support Nathan to reach his goal of raising funds for ten other kids with disabilities to get their own Freedom Wheels bike so they can ride for the first time in their lives. Support Nathan here – every little bit counts!